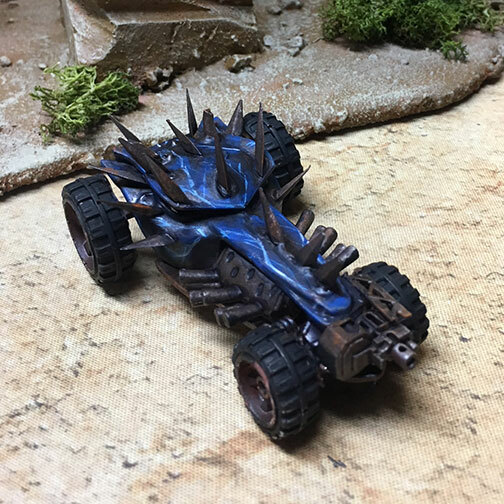 Gaslands – One day I'll finish a race – honestly. 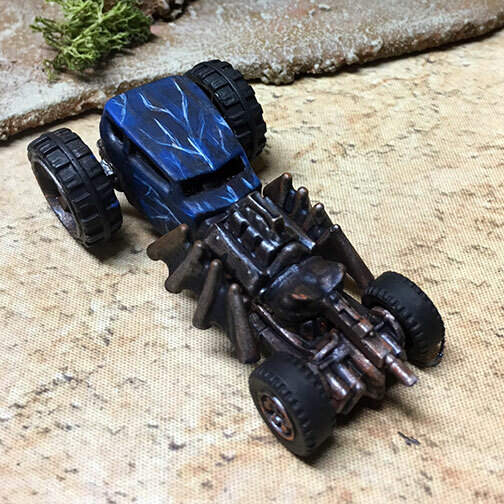 I had a chance to play several games of Gaslands and have yet to make it further than Gate 2 before losing all my cars. I probably am pushing to hard and not managing my Hazard tokens well enough which means I flip or hit something and then the rest of the pack catches up. The most recent team I ran consisted of two performance cars with nitro and heavy machine guns. Since this was my opponents first game of Gaslands we opted to not use the perks or audience vote mechanics. He ran a performance car, truck and car two with machine guns one with a ram. Out of the gate I hit my NO2 and took the lead with a bunch of hazards with my first car, the second got stuck behind his truck and had to do some defensive driving. Six hazzards meant my first car flipped and hit a rock formation stopping my momentum, taking out a bunch of hull points and allowing the rest of the cars to catch up. Several collisions later the area in front of the first gate was littered with the wreckage of my two cars and his truck. Restraint seems to be in order, perhaps the next game I'll make it around the full track.